You want to know how I feel about Pixels? Meh. I don’t feel anything at all. Do I think it is the worst crime against humanity, like some critics? No. Do I think it is a great movie? Absolutely not. I feel whatever about it. It was a movie that I’m not going to get riled up about it because it wasn’t important. I don’t mean I went into the movie thinking this, but after watching it, I came to this realization. I’m so indifferent, I’ve already forgotten most of it. Pixels is just simply there, some will notice it, but most won’t. Like most movie-goers, I, too, have given up on Mr. Adam Sandler. The actor who used to make silly but solid comedies hasn’t given audiences anything satisfying since I Now Pronounce You Chuck and Larry—and I’m even in the minority for that one. I don’t know what exactly happened. He went from stupid comedies to better comedies, to dramatic roles, all the way back to the stupid comedies he started with. He managed to fall back to square one. But still, I don’t find myself at his door with a torch and pitchfork in hand. Sandler wants to make the kind of movies he wants, and as long as they make money, that will never stop. If that’s what he wants, that’s fine, just don’t ask me to like them. 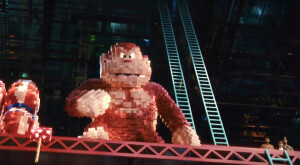 Pixels tells the story of an alien invasion, which comes in the form of old-school, arcade video games such as Pac-Man, Donkey Kong, and Centipede. The President of the United States, played by Kevin James, gets the only person he knows who can take on these classic games—his best friend, Brenner (Sandler). Brenner was one of the best video game players in the 1980s. So now, he and a few old friends, played by Josh Gad and Peter Dinklage, must join forces to stop this invasion and save Earth from total destruction. The film was directed by Chris Columbus, who’s name is attached to some classic movies like Home Alone, Mrs. Doubtfire, and two Harry Potter films, but not even his direction could save this movie. The problem with this movie is it relies on the nostalgic factor so much, the rest of the movie is just Sandler and friends phoning in performances. See, just because they put something on screen that I and the audience recognize doesn’t mean anything. That isn’t enough. It is what you do with those characters that we know and love. Wreck-It Ralph is a perfect example, a movie is also about classic arcade games, but we get to see these characters out of the game. They are hanging out, walking around interacting with other games, Disney did something with those nostalgic figures. Pixels essentially holds a great big sign that says, “Donkey Kong Here!” That is its fatal mistake. Not to mention, this movie isn’t about the video games. It’s a Sandler movie, and these game characters are just in it, not the other way around as it should be. As I said, Pixels doesn’t mean anything to me. I didn’t think it was the worst film of the year, Unfinished Business and The Gallows are still duking that one out. But, it wasn’t anything I would dare recommend to you, my readers. If you are a still Sandler fan then by all means go ahead and enjoy, but if you are going because of the video game aspect, pop in Wreck-It Ralph and save yourself the time.